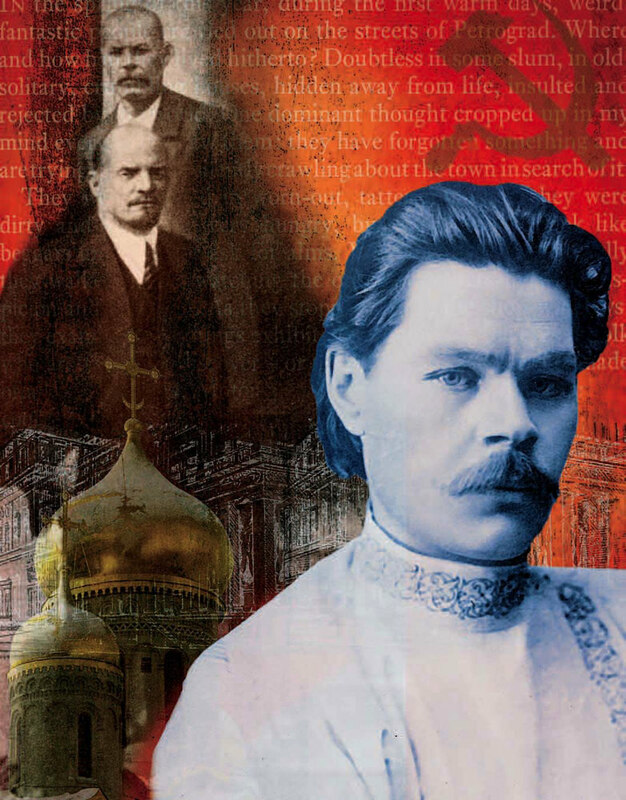 For much of the early twentieth century, Maxim Gorky was probably the world’s most famous writer. His early romantic stories from the 1890s, with heroes drawn from the millions of peasants-turned-tramps then roaming the Russian countryside, marked him as an exciting new force in Russian letters that cut across class lines, blurring the distinction between high and low literature. His 1902 play The Lower Depths took his homeland and then Europe by storm. These works and his 1914 autobiographical masterpiece, Childhood, found millions of readers, including many Russians who had rarely, if ever, read before. He appeared out of the blue, a contemporary critic recalled, “an emissary from the anonymous Russian masses.” Rejecting with contempt Russian literature’s traditional sympathy for “the insulted and injured” along with its glorification of the peasant as a repository of wisdom and national values, he celebrated instead action, will, initiative, creativity. “‘Man’—it has a proud ring!” he proclaimed in his most famous line. “Man” was the active center of his optimistic new faith. “Man” could do anything: “He even invented God.” Amid a widespread, if inchoate, feeling that an age was ending, Gorky offered a bracing vision of the new and beautiful world that could and should replace it, to be brought about by the harnessing of individual and collective will, the transformative power of culture, and the application of technology. Gorky’s fame arose from his writings, but quickly threatened to transcend them as he became a celebrity in the full modern sense, his image for sale on cigarette boxes and postcards, his movements and opinions of equal interest to the public—whose commitment to revolution he sought to mobilize—and to the repressive tsarist regime. His place in Russian life and letters was unique. A prodigiously gifted autodidact who quit school at 10, he came of a once well-to-do family of artisans that had fallen into poverty; as a result, he spent his formative years in an astonishing variety of jobs before becoming a writer. An archetypal outsider, he fit none of the familiar social and cultural categories and he cultivated that image. It suited his commitment to political activism quite as much as his commitment to literature, and his activism, making good on the implicit urgings of his writing, made him a hero to many. His was, in sober fact, a fabulous career. A brief summary reveals the fellow-hobo and chronicler of the uprooted peasantry; friend of Lenin and fundraiser for the Bolsheviks; political exile on Capri (1906-1913); outspoken opponent of Lenin’s fledgling regime (Petrograd, 1917-1918); savior of thousands of writers and scholars from starvation, and rescuer of many from arrest (Petrograd, 1918-1921); expatriate author of memoirs and dark, quasi-symbolist stories in Germany and Italy (1921-1928); returnee in the early 1930s to Soviet Russia, hailed as “the great proletarian writer,” herald of the revolution, founding father of Soviet literature and inventor of “socialist realism,” for whom his native city and Moscow’s main thoroughfare, along with hundreds of institutes and enterprises, were renamed; and finally the preacher of merciless class hatred, smothered with state honors but increasingly isolated, in effect the prisoner of Stalin, who may have had him murdered. But the life trajectory just described is that of a pseudonym. Gorky was born Alexei Maksimovich Peshkov; he adopted the pen name (gorky means “bitter” in Russian) in his late twenties as a kind of public provocation, and it soon took on a life of its own. “A time will come,” Anton Chekhov wrote in 1903, “when people will forget Gorky’s works, but he himself will hardly be forgotten even in a thousand years.” Another contemporary noted, “[M]ore important than anything he says is what he is”—and, we might add, what he was taken to be. With the opening of Russian archives and lifting of longstanding taboos since the fall of the USSR, the ways in which Gorky’s public image was formed and propagated are at last available for serious study and reassessment. Recent Russian publications show in new and often surprising detail just how (and how far) he was indeed a key figure—at once absolutely unique and supremely representative—in the history of his times. And the man behind all the contradictory positions and beliefs, the whole huge but wavering public image? He was notoriously reticent about his personal life, which he professed to dislike except as raw material for his writing, and odd as it may sound, he seems to have taken pains to have as little of one as possible. (The autobiographical Childhood, a critic noted, “is about everybody but himself.”) His interest in behavior, his own and others’, was not accompanied by any interest in analyzing its causes—the “anti-psychologism” of his writing is often noted; hence detailed discussions of his loves and hatreds, his finances, his relations with Bolshevik leaders and with writers of the most varied stripe, have had to wait for the disclosures now coming to light in Russia. These new materials offer the outlines of an astonishingly broad, complex, and multifaceted personality—highly fallible, on occasion willfully blind, stubborn, passionately inconsistent—that fascinates more deeply with every new revelation. That it continues to elude final definition reminds us that this is precisely what characters in the greatest literature do. There, surely, as Chekhov seems to have sensed, is one earnest of his immortality. Harry Levin professor of literature emeritus Donald Fanger, Ph.D. ’62, is translator and editor of Gorky’s Tolstoy and Other Reminiscences, recently published by Yale University Press.